England extended their unbeaten run to 13 games after an absorbing game at Twickenham where two of our club volunteers were honoured. The day started early for me as I tried to get a good spot in the Cardinal Vaughan car park to set up for drinks for guests of Eastern Counties. The CB has invested in a new canopy which definitely stood out. 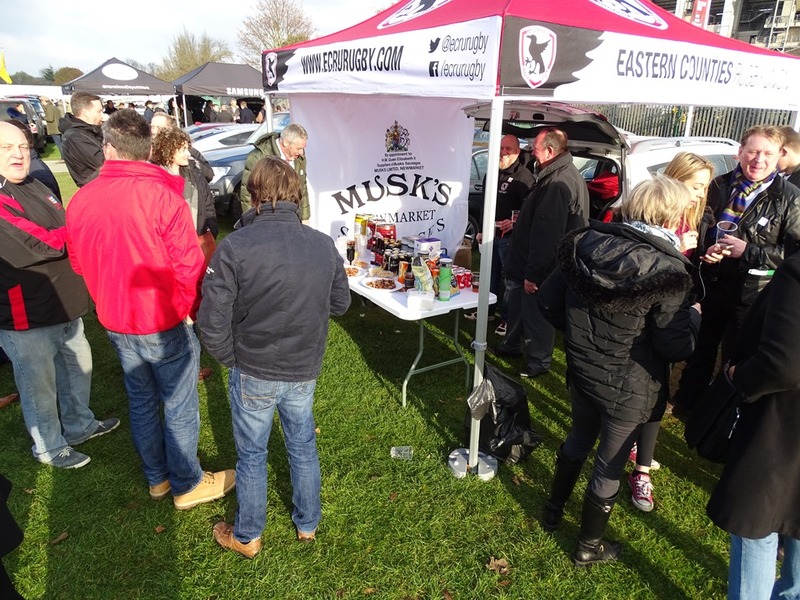 We have offered drinks at every Autumn International and Six Nations series since 2013 and each year it has got more popular. This time as well as our main sponsors Greene King providing the beer, our Women & Girls sponsor Musks supplied us with 10lbs of cocktail sausages which proved to be very popular. People arrived at the Eastern Counties area from 12 noon and a steady stream of players, officials and members associated with our clubs came and went until soon after 2pm when we had to make our way to our seats. We probably served over 100 people during that time and many thanks are due to Pamela Clarke, Russ Clarke and Brian White who were kept busy pouring drinks and replenishing the food. It certainly raises the profile of Eastern Counties and we next plan to do the same at the England v Scotland game in March. The first scrum of the game came after 36 minutes and provided over 10 minutes of drama as Argentina won penalty after penalty which first reduced England to 13 then produced their first try. When Argentina scored at the beginning of the second half to reduce the gap to two points while they still had a two-man advantage, the crowd feared the worst but the England players stepped up again and when Johnny May scored I knew that the game was won. At the post match dinner the two captains spoke and they both looked absolutely exhausted. Dylan Hartley said that playing with 14 men meant the the game was faster as there was more space, more tackles to be made and no cover available if you made a mistake. But England did a rare thing in winning a game a man down for most of the match. 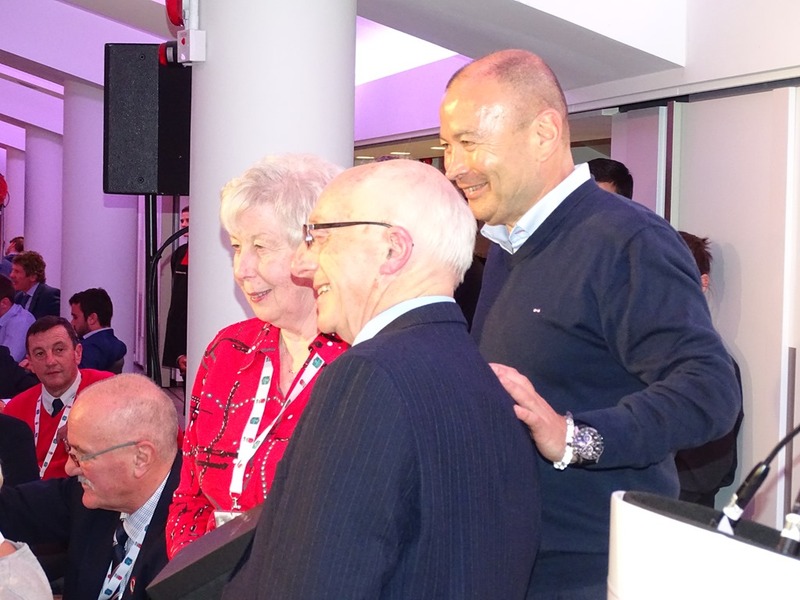 At the dinner the RFU honoured volunteers who had been put forward for Lifetime Achievement Awards and for Eastern Counties these were given to Shelagh and David Tate from Mistley RFC. Those at Mistley and surrounding clubs know how much they have put into the club, not always the figureheads but tirelessly working behind the scenes. It is fair to say the Shelagh is the more visible of the two but she couldn’t do that without David’s support for her and the players and members at Mistley. They were presented with their award by Eddie Jones having spent the day at the stadium with a tour, lunch and dinner plus accommodation at the Petersham Hotel in Richmond, formerly the England base in Will Carling’s day. So we look forward to the last game of this Autumn series and probably the toughest for England, but I think the best is still to come from this squad.